These high-end wire scissor suits brilliant for wire removing of dense crown, and further for daily use. They can cut Aluminium-wire up to 2,5 mm and copper-wire up to 2 mm. Please choose product... Wire-scissor, Professional (160mm) - 22,- EUR - SOLD OUT ! 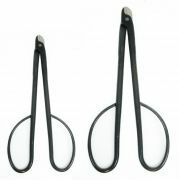 Wire-scissor, Professional (200mm) - 26,- EUR - SOLD OUT ! Wirecutter for easy de-wiring of your bonsai. Wire is easily cut. The nose is flattened, so you can`t accidently cut into the bark. Wirecutter for removing thick wires from your bonsai. The nose is flattened so you cant accidently cut into the bark. Made in Japan. Wire cutter for removing wires from your bonsai. With spring between the handles for relaxed and precise work. Jin-pliers are usefu tools for caring and shaping bonsai. You can use it for Jin/Shari techniques (remove bark etc.). Further you can use it to wire your bonsai with thicker wire. Made in Japan. Please choose product... Jin-pliers (175mm) - 28,- EUR Jin-pliers (230mm) - 32,- EUR - SOLD OUT ! Jin-pliers are useful tools for caring and shaping bonsai. You can use it for Jin/Shari techniques (remove bark etc.). Further you can use it to wire your bonsai with thicker wire. Made in Japan. Wirecutter for easy de-wiring of your bonsai. Wire is easily cutted. The nose is flattened, so you can`t accidently cut into the bark. Jin-pliers are useful tools for caring and shaping bonsai. You can use it for Jin/Shari techniques (remove bark etc. ), as well as to wire your bonsai with wire. Made in Japan. This bended jin-pliers is to be used in bad accessible areas in dense crowns etc. Made in Japan. High quality shears made by Masakuni (Japan). Very sharp and hard blades for long lasting hold. High-grade stainless steel (S). Cuts Aluminium Wire up to 2mm, Copper-Wire up to 1,6 mm and Iron-Wire up to 1mm. High quality shears made by Masakuni (Japan). Very sharp and hard blades for long lasting hold. Stainless steel with hard chrome-plated blades/nose. Professional Made in Japan wire cutter for thick wires. Extra long version with a stainless steel coat and slightly bended handles for better grip. Cuts aluminium wire up to 4 mm, copper wire up to 3.25 mm and iron wire up to 2 mm. Further useful to bend thick wires while forming your trees. Universal Wire Pliers for thick wire. Essential tool for exact wiring and de-wiring, allowing a good fine grip to get of small wire pieces form the bark. High quality Wire Cutter made by Masakuni (Japan). Very sharp blades. Cut easily aluminum wire up to 2 mm, copper wire up to 1,63 mm, and iron wire up to 0,95 mm.